I decided to start my scan from the western horizon upward. The first challenge was attempting to receive the satellite that is the lowest possible elevation to the west, then tracking the belt upwards to reach the other satellites. At least, this way, I will be able to say that I didn’t miss anything. At the 83 degrees east slot, there are four co-located satellites, of which three are C-band capable – G-Sat 10, G-Sat 12 and Insat 4A. All are built to serve India to my knowledge, so reception in Sydney seems extremely unlikely. Satbeams seems to think there are no channels, but LyngSat seems to claim some on both G-Sat 10 and Insat 4A. From my location, the elevation comes in at 9.7 degrees which is quite low but might be just enough to clear distant trees and fence. To try for this satellite sounds stupid given the circumstances. 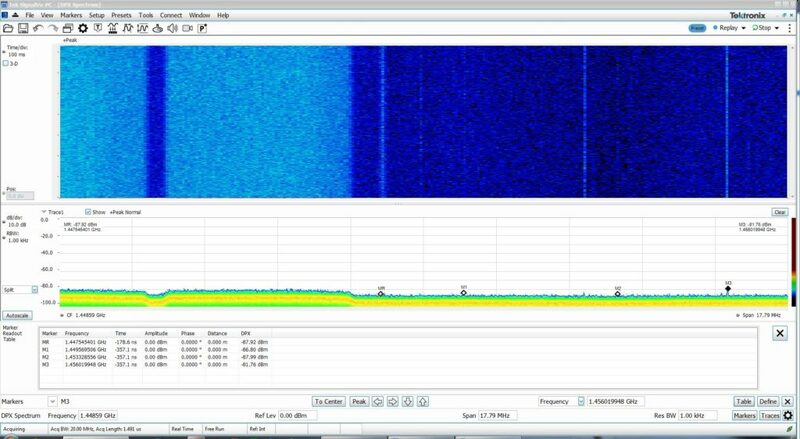 Instead, I ended up locked on 87.5 degrees east on ChinaSat 12 and decided to lower the dish slightly to see whether I could hear anything. I wasn’t expecting to hear anything and that would give a baseline as to what to expect. 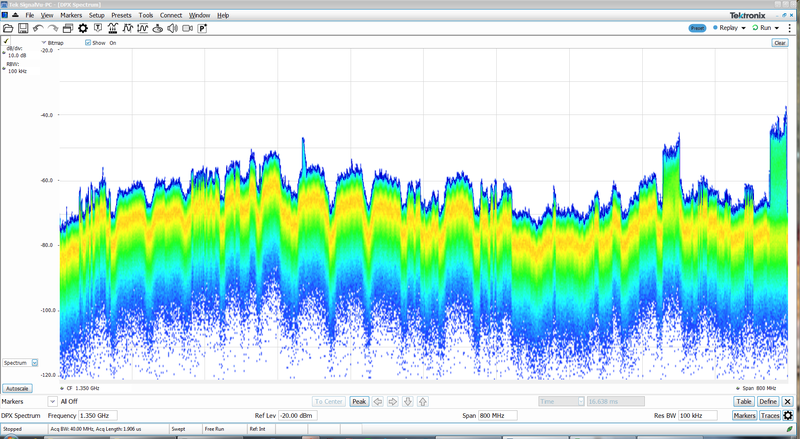 A CrazyScan trace from the Prof 8000 shows what appears to be mostly quietness. 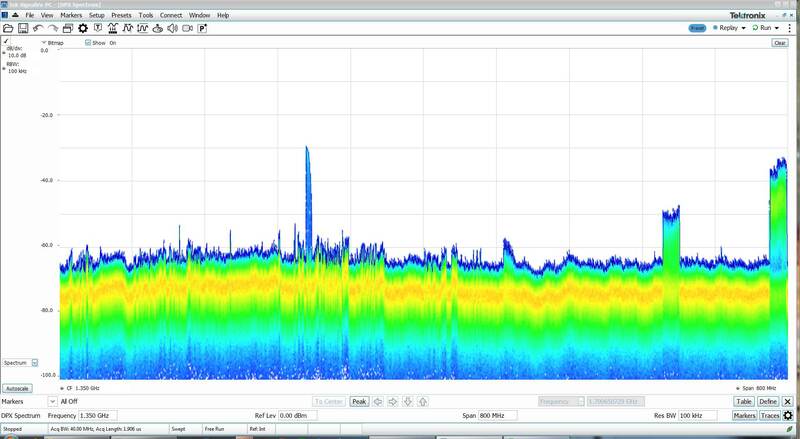 Some very strong spikes from 3400Mhz and 3525Mhz are so strong that they’re probably terrestrial interference. The interference near 3930Mhz is a bit weaker, so its origin is unknown. There’s a few small bumps near 4150Mhz too. 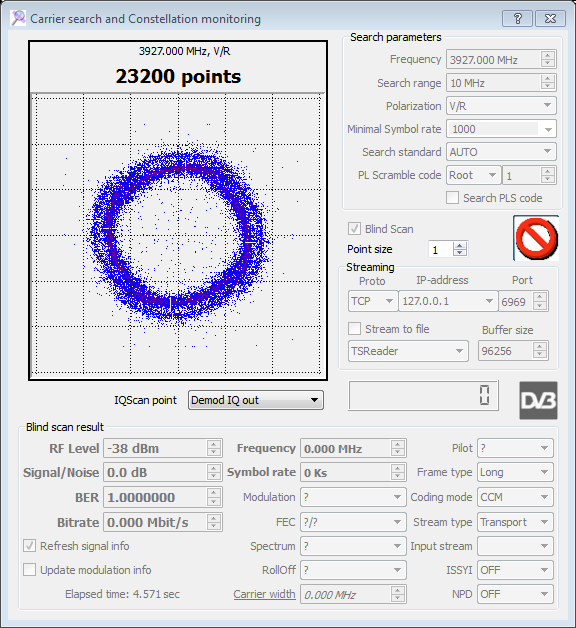 If you blindly ask the card to lock the interference, you get a nice “ring” which isn’t quite perfectly circular on the I-Q constellation diagram, but it’s definitely not a DVB-S/S2 signal. The bumps near 3400Mhz and 3525Mhz were quite easily spotted on the spectrum analyzer as LTE-style signals. Square edges, wide bandwidth, blocks in the frequency domain turning on and off. The reason for their appearance is mainly due to their high strength and vulnerability of the LNB itself. 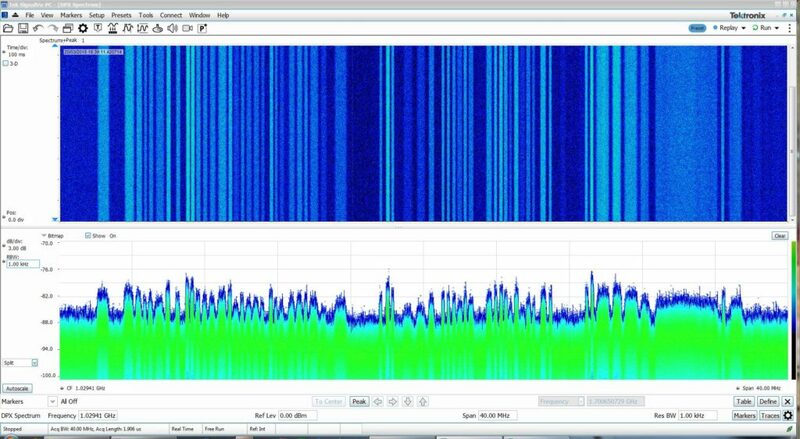 Half those frequencies corresponds to 1700Mhz and 1762Mhz, which are roughly the same frequencies used for 1800Mhz LTE in the phone-to-base direction. Another possibility would be 3500Mhz LTE which is operated on a trial basis. The other interference near 3930Mhz is a bit of a challenge. 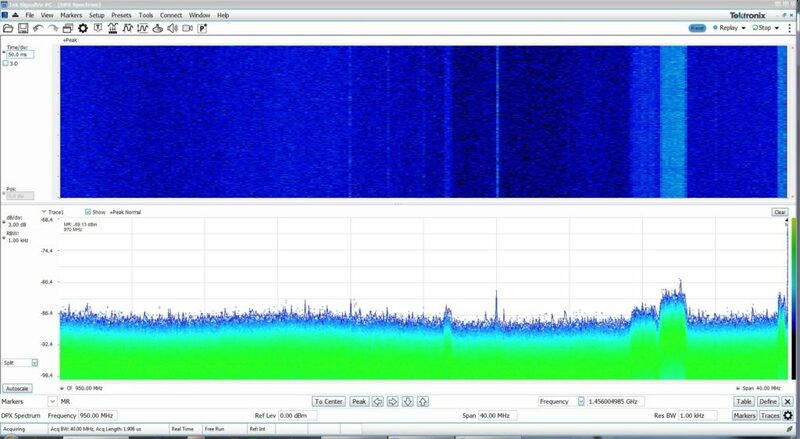 At a wider RBW, it seems to consist of a signal which is spread across about 3Mhz of bandwidth. I would assume given the swept nature of the signal, it is a radar or ranging signal of sorts. The signal strength makes it possible that it is a signal emanated from a spacecraft. At a narrower RBW, it seems it could be a coded FHSS style transmission of sorts to protect against jamming. I suspect this could be a terrestrial radar (e.g. weather radar, as we have a C-band radar in Wagga Wagga which might have been scattered by cloud), but I couldn’t confirm the frequency on the ACMA Radcomms page. It seems this frequency band is used for licensed point-to-point microwave links, but the expected modulation width is 40Mhz. Not being satisfied with a could be, I decided to take a closer look at the satellite itself. Unusually, G-Sat 10 carries a navigation payload called GAGAN, designed as an SBAS for the Indian market. According to some presentation slides, it uses a CDMA Ranging at 6712Mhz uplink and 3412Mhz downlink with a bandwidth of 24Mhz. While this would put the signal output in the middle of the LTE interference mess and it doesn’t explain this particular signal, I think it deserves mention nonetheless. So far, nothing in the spectrum seems to suggest I am receiving anything from a satellite. I looked around a little further and to my surprise, I saw something that appeared to be satellite beacons. In the horizontal polarity, there are quite a few carriers (at least five well defined ones) with modulation visible around 4192.5 +/- 10Mhz (RF) at the upper end of C-band. 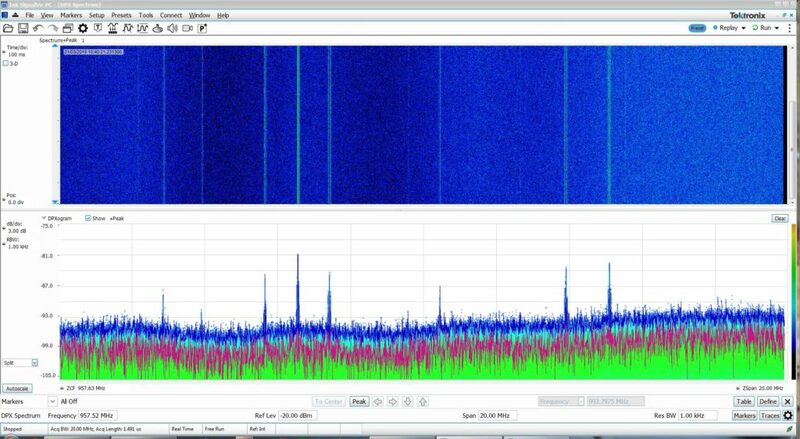 Now that I look at it, I can’t be entirely sure that all of these are actual signals as some could be intermodulation products within the LNB or analyzer. Switching to vertical polarity did not affect the signal strength, so it appears the beacons are likely circularly polarized. They appear to be continuously modulated, but sadly, I didn’t take a closer look at each of their modulations and subcarrier spacing. The right pair of beacons exhibits some interesting properties. 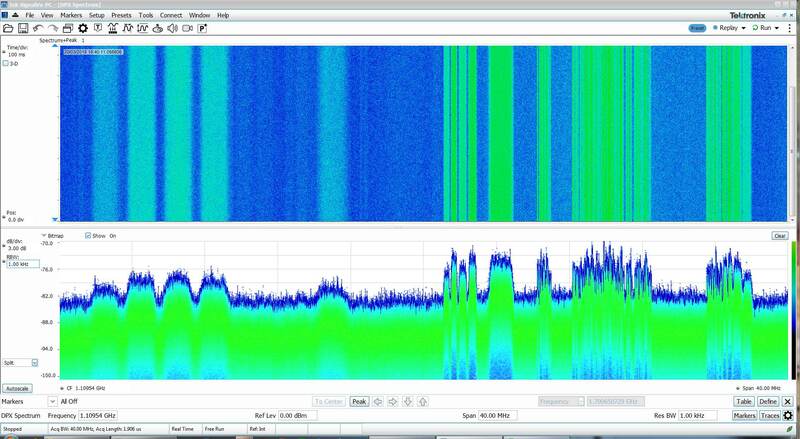 We can see from the DPX waterfall that the modulated sidebands disappear at times in synchronism. 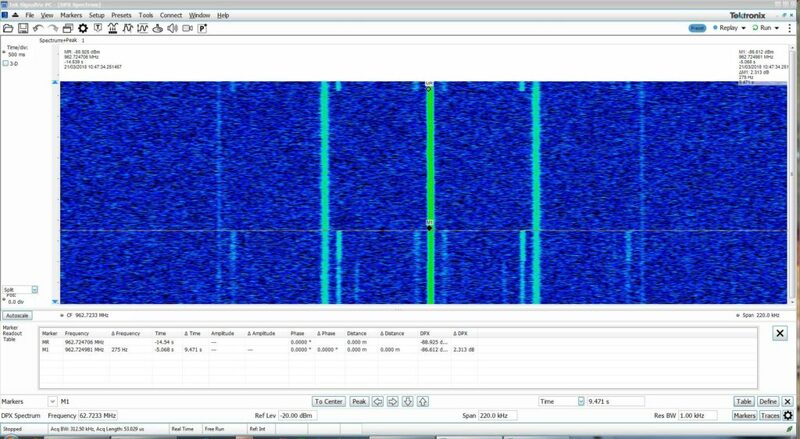 Thus suggests this pair of beacons belongs to the same satellite – the frequencies seem to be spaced about 1.3Mhz, with the two beacons around 4188.583Mhz and 4187.283Mhz (RF). The beacon has a modulated data phase lasting about 10 seconds. The slight “lean” of the signal gives us a good hint that the signal is going through the LNB and is suffering from the DRO drift instability – it’s likely space borne but not guaranteed. The modulated periods are separated by about 9.5 seconds of idle time. 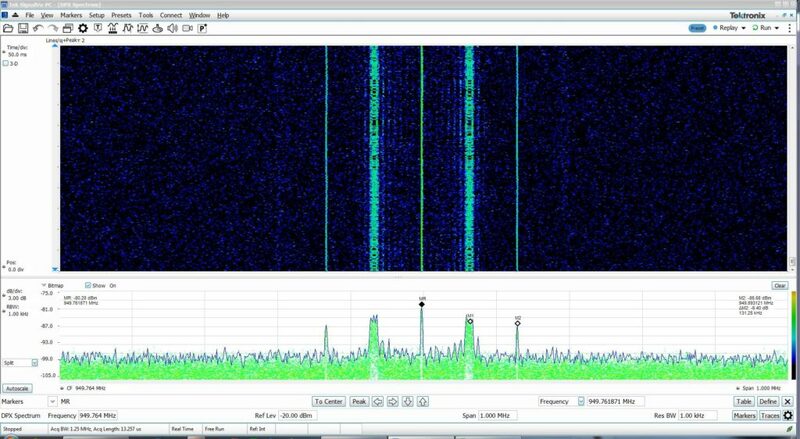 This is not like any terrestrial signal that I’ve seen – it appears to be an FSK subcarrier on an AM modulated transmission. 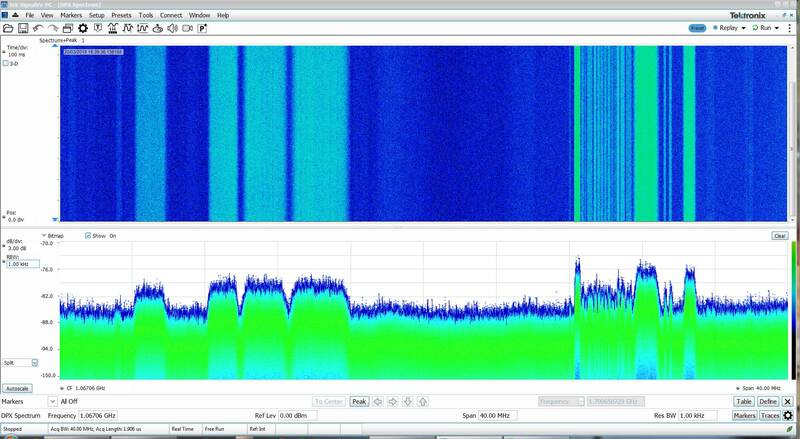 The mean subcarrier frequency is ~29khz, with a total shift of ~4khz. So it seems quite likely I was hearing beacons from a satellite, but the identity of the satellite remains somewhat mysterious. The Indian satellites at 83 degrees east seem the most likely candidates, but I can’t be entirely sure. Maybe it’s an entirely different satellite, being received through a side-lobe? It was nice to start off with a little mystery, but it’s always more comfortable to positively be able to identify the satellite. 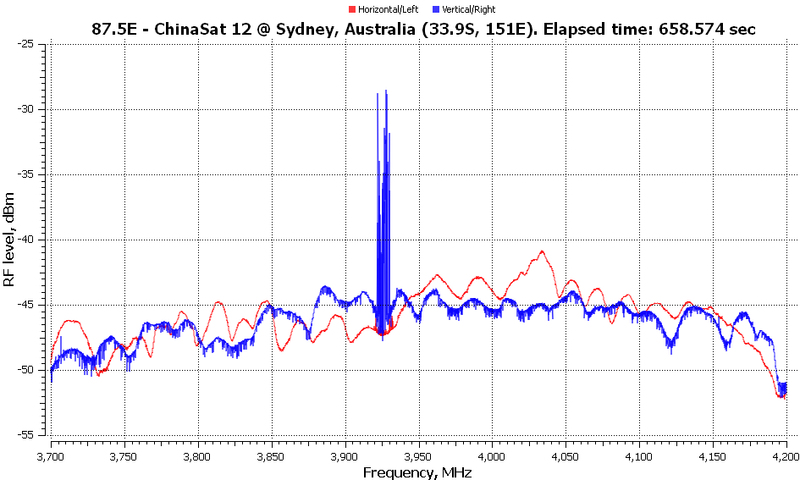 Moving a little further up to 13.4 degrees of elevation, we hit ChinaSat 12. Unfortunately for me, this is another satellite where I am outside of the intended coverage footprint of the C-band beam and only have “weak” Ku beam coverage. But there are no Ku services that are known. So how do I know I’m on a satellite? Well, for one, I saw some movement on the spectrum analyzer. For another, I managed to lock a carrier (barely). CrazyScan on the Prof 8000 shows how dire the signal is. 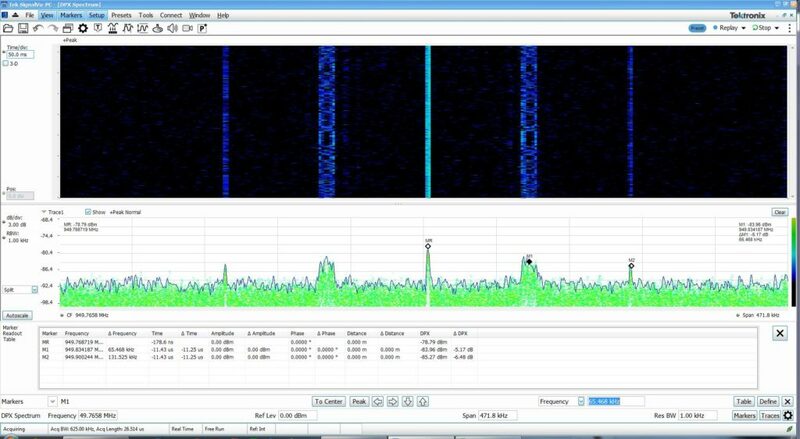 While we can see the general outline of the transponders, it seems to be afflicted by fading or modulation especially in the Vertical polarziation. 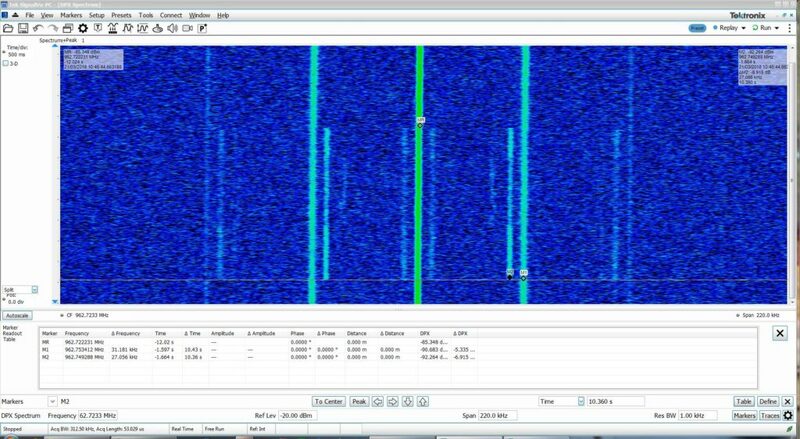 The interference near 3930Mhz is strong compared to the intended signal – this being present again suggests it is terrestrial in nature. 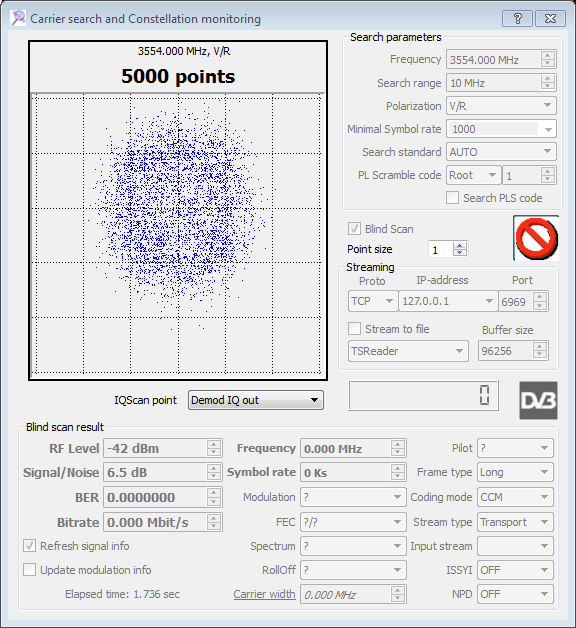 The BLScan reports just one lockable transponder, with one video program – YNIC with H.264 standard definition video and multiple MPEG-2 AAC audio streams although with a lot of errors. Locking even just one service is enough for me to confirm that the dish is aimed at a known satellite. 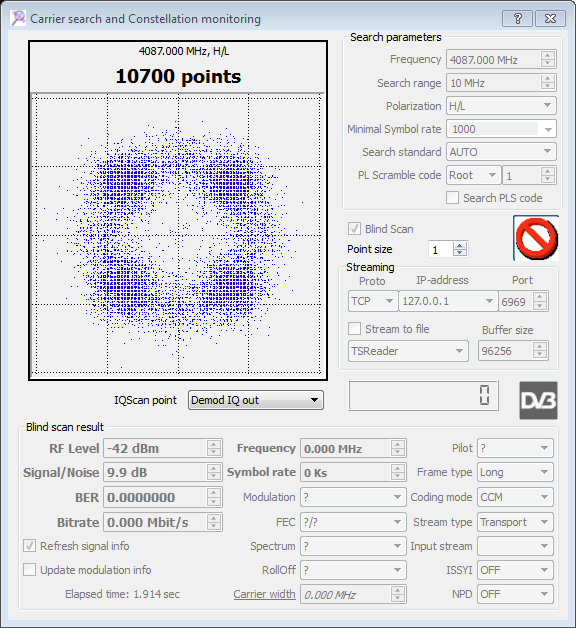 A full swept spectrum (including extended C-band areas the satellite is known not to be broadcasting in) in the horizontal polarity (above) and vertical polarity (below) gives more detail than the signal-strength based graph that CrazyScan is able to. 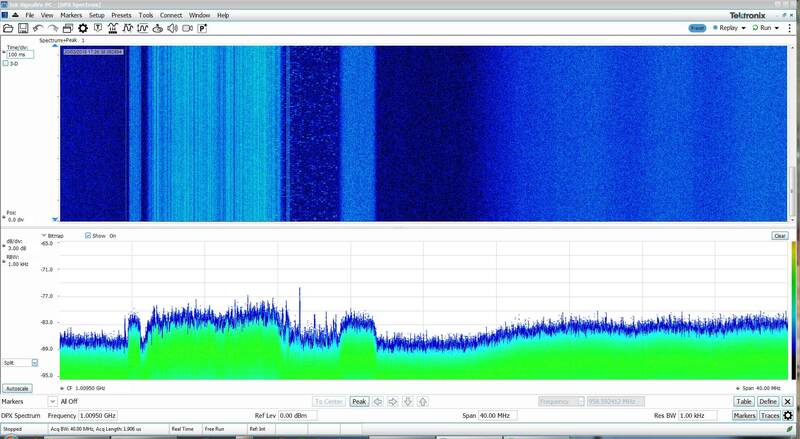 A walk through the spectrum on the horizontal polarity reminds us that satellites are much more than just satellite TV. The use of VSAT terminals to access data services in remote areas or as back-up in case of terrestrial infrastructure failure is important for many industries and utility services. These signals often use narrow bandwidths to reduce costs, and require absolute stability in frequency to avoid treading over each other. In a span of 40Mhz, we can see countless services only about 250khz wide that have been through a number of frequency conversion steps. Amazing. These seem to transmit almost continuously. There are also some other services nearby which are a little wider – it’s amazing to think they’re all co-ordinated so as to avoid interference by having guard bands and limiting transmit powers. 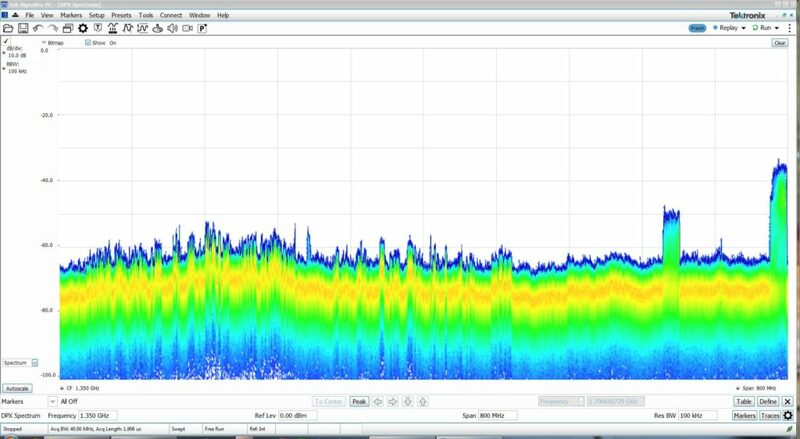 Narrow <1000kS/s DVB-S/S2 carriers are hard to lock partly for this reason – specifying frequency to the Mhz is not accurate enough, and neither is the stability of regular DRO LNBs to ensure the right frequency is chosen each time. The interference is here too … as expected. The modulated beacon was very unusual. It does not appear to be quite the same as those I’ve seen before with a solid AM carrier – this looks like AM where the carrier frequency is somewhat frequency/phase modulated? Very odd. 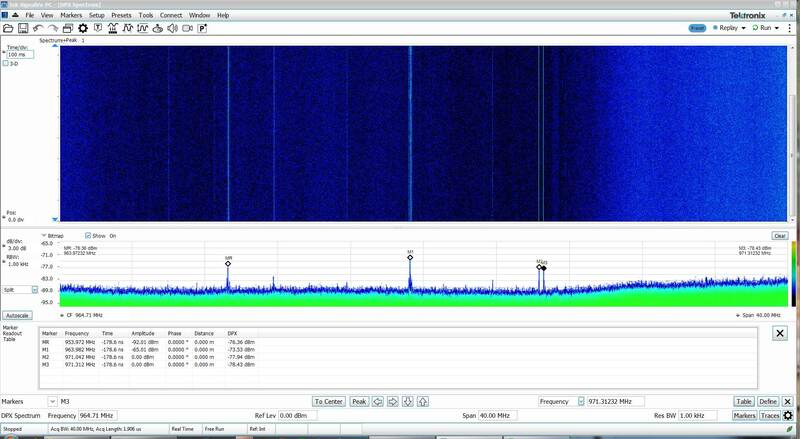 Could it be interference causing intermodulation in the LNB? Even those that I thought were unmodulated look like they’re being swept when looking close enough. One appears to have hints of a subcarrier sideband. Might this be a sign that these emanate from a nearby neighbour being received weakly? 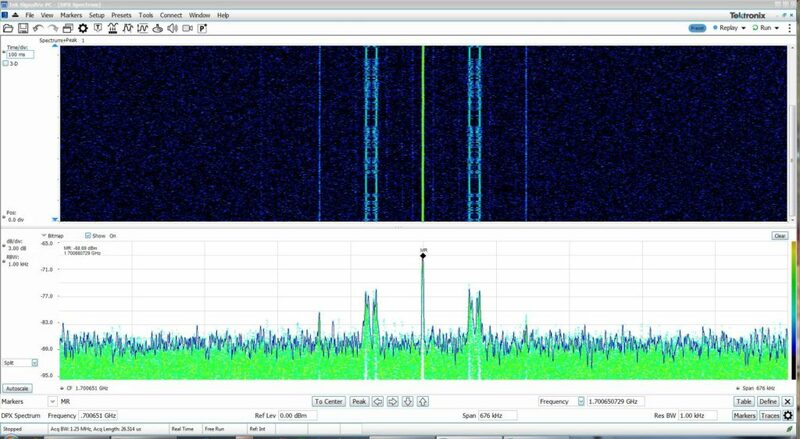 Or maybe it’s not a satellite beacon at all, but instead transmissions used by VSAT terminals as their frequency reference? Towards the upper side of the RF spectrum, there is one beacon of a traditional sort in the horizontal polarity (top) that disappears in the vertical (bottom). The RF frequency is 4200.231281Mhz. This looks like another AM type modulation with FSK/PSK subcarrier. 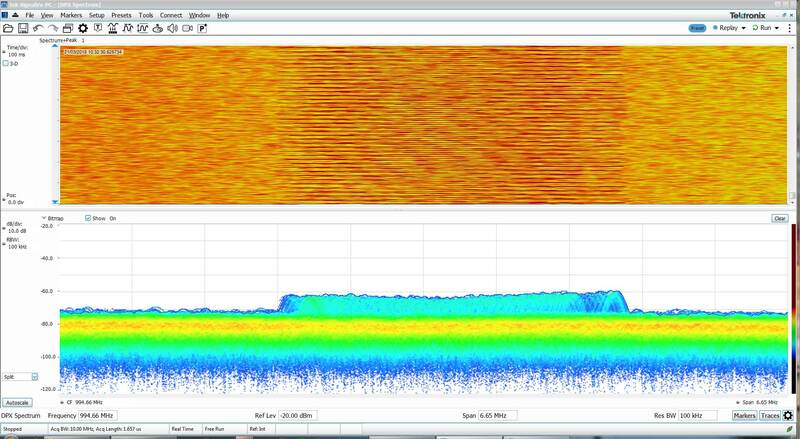 The subcarrier is at about 65khz, but there is an outer line at about 131.5khz (maybe it’s a mixing product). At longer time-scales, we can distinguish what seems to be patterns in the FSK. The next one up is the 91.5 degrees east slot at 16.7 degrees elevation, where three Measat satellites presently reside, of which Measat 3 and 3a provide C-band service. The footprint of these services cover Australia, although Sydney is slightly disadvantageous in terms of signal strength. There’s quite a few services according to Lyngsat on both 3 and 3a with 3 responsible for extended C-band and the vertical polarity on normal C-band, and 3a providing horizontal services in normal C-band. This allows both satellites to share the same slot and provide service without interfering with each other. The CrazyScan output gives us hope as we see the outline of the transponders, but it seems some of the extended C-band transponders are wiped out thanks to the local LTE uplink interference. I suppose this is why you have to plan your frequencies carefully for such “unintended” consequences. Using a full BLscan, we got only three lockable transponders. Note that blind-scanned symbol rates are always out by a small margin – often by one or two kilo-symbols/second on this card. By using the known list of transponders, we can try them out as well – blind scan tends to work poorly for weaker signals and certain carriers just don’t seem to work with it, but can be locked in manually. Actually locking and analyzing the transport streams revealed nothing particularly new, but at least I managed to see these services on the air – FTA for free, ENC for encrypted. 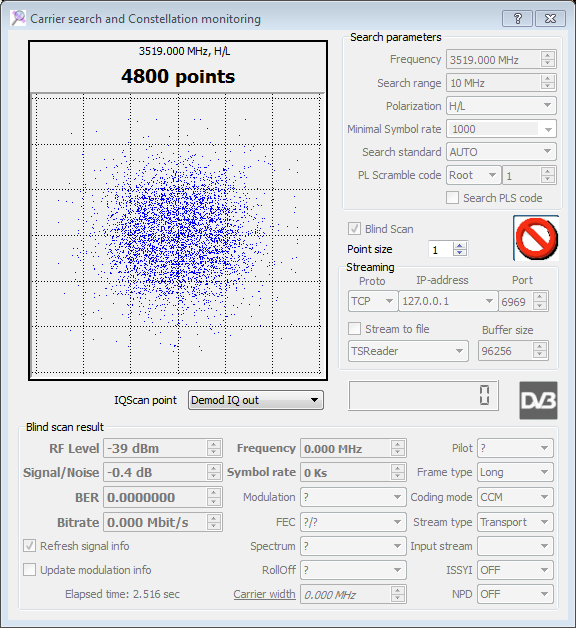 This one didn’t return the modulation mode, but being -0.4dB SNR means that the card did believe it found something that’s DVB-S/S2 type. 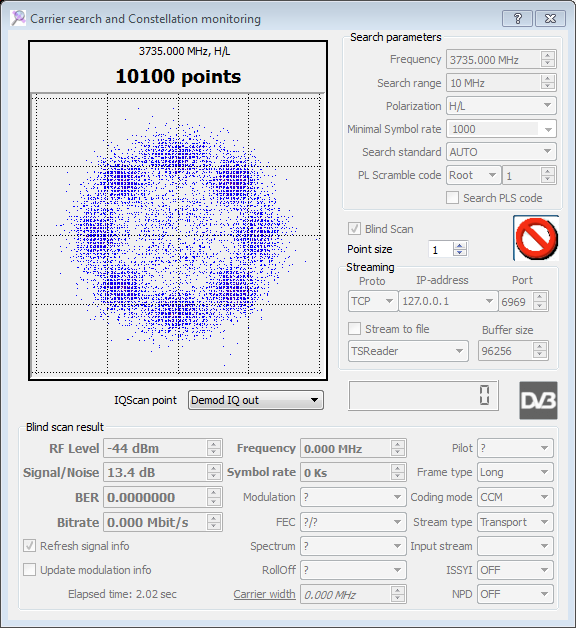 No lock but reporting a healthy but noisy I-Q constellation plot – likely a poor signal or a mixture of ACM/VCM that this particular demodulator cannot handle. With very high likelihood this is an ACM/VCM stream with some 16APSK component to it – it is plotted but not locked. This also appears likely to be a QPSK and 8PSK mixed ACM/VCM stream. A fully scanned spectrum of the satellite in horzontal (top) and vertical (bottom). As usual, there are data carriers – the one on the left has a striated appearance on the spectrum which suggests there is a particular “idle pattern” which is interrupted by data (darkish bands). But more interesting is the two strong CW lines to the left, which I suppose is the reference frequency beacon for this system, sent through the satellite, to allow end-user terminals to use this as a frequency reference to keep their oscillators in check. On the vertical polarity, there is another wide system with a different striated pattern, next to what appears to a TDMA or FHSS system. On the horizontal polarity, there’s a mixture of reference pilot tones, narrow/medium/wide data carriers and slotted TDMA style systems. The above is 4186H, and it seems that it is an AM modulated beacon with two FSK/PSK subcarriers. The one at 4196H follows much the same scheme, but with one FSK subcarrier. 4200V appears to have a subcarrier but it seems to be a single carrier of narrower form compared to the other FSK/PSK carriers but that could be a bit deceptive due to the weak signal nature. 4199V appears to be much the same as the above – a bit more narrow with a single subcarrier. 4191.4V has a wider subcarrier that appears like the other FSK/PSK type of wider sort. While looking around, it seems there is a lower-end beacon as well at about 3449.349Mhz which seems to be circular polarized with one FSK/PSK subcarrier. Communications satellites carry more than just TV and without something more sophisticated than a DVB-S/S2 tuner card, you might miss it. It’s probably no big problem, but it’s good to know that while the direct-to-home popularity seems to be waning, the bandwidth is actively being used by other satellite modems and VSAT terminals for data connectivity. 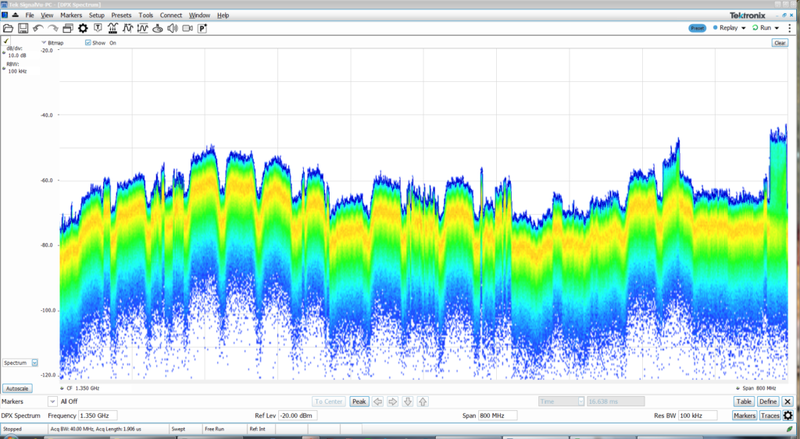 The signals are, even looking visually at the analyzer output, rather interesting to see for the first time.